Uneven Geographies focuses on projects by artists concerned variously with visualising the transnational mobility of capital, goods and people in today’s global networks. Its point of departure is the assumption that the opaque and labyrinthine workings of worldwide economies tend to frustrate attempts to represent the historic conditions and expanding geographies that define current forms of globalization. 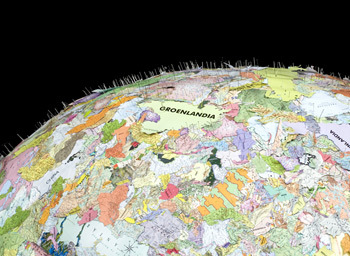 Artists have consequently turned to the invention of innovative ways of imaging and narrating, analysing and reconceptualizing the processes and relations of globalization – whereby geopoetics mediates geopolitics. Without returning to an imaginary lost language of objectivity, these artists’ practices mobilize experimental forms of transnationalism — whether in regards to labour, migration, or resource allocation — via active and creative re-stagings by which the underlying relations of profit and exploitation become legible and are imaginatively reconfigured. These strategies creatively re-animate the novelistic and poetic, the cartographic and the documentary, the performative and the ludic, which connect to global processes situated in relation to varied geographies, including Mexico, the Congo, Morocco, Central Asia, the Bahamas and Mumbai. In the case of Fahlstrom — here the exhibition’s historical forebear — and Lombardi, networks are tracked, rhizomatically, around the globe in diverse flows of capital and relations of power. With the photographic and video-based projects of Barrada and Biemann, passages of migration are imaged with ambivalence, evoking both the disenfranchisement of statelessness and its empowering potential. Whereas McQueen invests the imagery of Sub-Saharan manual labour with perceptual affect and literary allusion, contesting documentary legibility yet connecting current operations to the history of colonialism, Goldin + Senneby reveal how the conditions of post-representation serve as well to cloak unregulated economic power today. These far-reaching engagements with the creative imaging of the cultural geographies of globalisation will be extended further through its public programme, in partnership with University of Nottingham and Nottingham Trent University. The programme include Lars Bang Larsen on Öyvind Fahlström, a short residency by Ursula Biemann, Renzo Martens and Alfredo Cramerotti on Episode III – “Enjoy Poverty”, John Tomlinson on the acceleration of capitalism, and a keynote lecture by Saskia Sassen. The exhibition opens with a one-day conference, The Geopolitical Turn: Art and the Contest of Globalization featuring Cramerotti (author, Aesthetic Journalism), Angus Cameron (co-author, The Imagined Economies of Globalization and emissary of Goldin + Senneby), Mark Fisher (author, Capitalist Realism), geographer Alex Vasudevan, Sara Motta (Co-Director of The Centre for the Study of Global and Social Justice at The University of Nottingham), participating artists Biemann, Dario Azzellini and Oliver Ressler, Bureau d’Études and George Osodi and the exhibition’s curators. All events are free but booking is essential.